New Update FORCES Payments Suddenly. So now an update has rolled out that forces people to pay to change text color, fonts, font sizes, & all? a helpful YouTube Video or anything now either as well .... just an ugly Link that needs to be Copy / Pasted. Way to go. Guess I'll start looking around now ... or just make everything accessible via Discord. Why block these simple things with a pay wall wtf. Where do you pay? I'm confused. 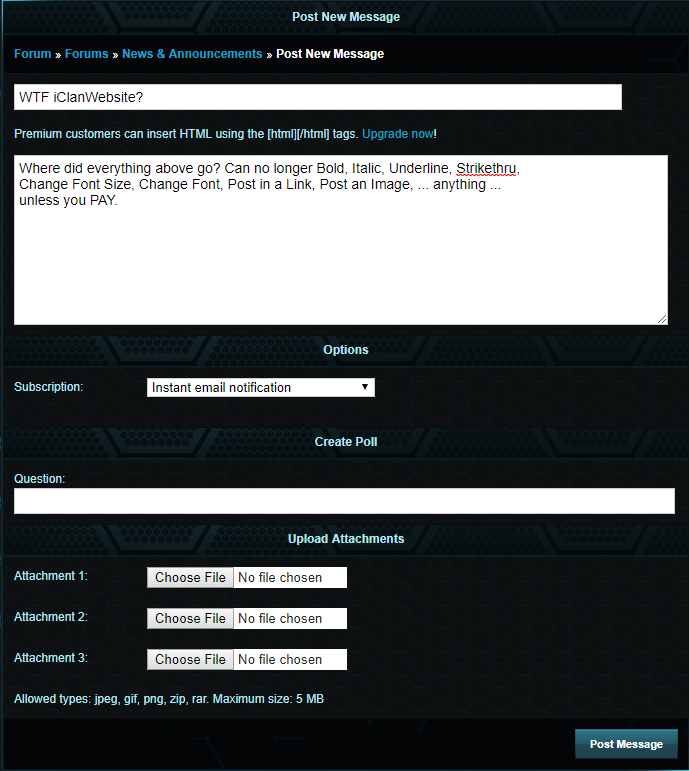 iClan are is re-doing their forums and this could be a tempory issue. Where do you pay? I'm confused. iClan are is re-doing their forums and this could be a temporary issue. If you look at the .PNG I posted along with my original comment, where it talks about "Become a Premium Customer"
by a Pay Wall ... seriously?! I'm confused, where do you pay. Your image shows nothing pertaining to that information. I have a premium account. You have presumed that you required a premium for those editing options merely because a change occurred around the same time when you reduced the standard of your account (from premium)? The options are missing for premium users too. Understand? Hello, we're missing the editing options still, is there any information on when we'll get them back? It seems we are missing the customer support, too. Although my correspondence via the ticket system has always been good and reasonably quick. Been considering a move to iClan but if this is how they do business I'm not in the mood for it and will continue with my looking around. Why is there no one answering all of these posts? If it helps, my ticket was addressed quickly and I had the menu options back within the website a week later.